It is with the deepest regret that we record the death of Mr F.M. Nelson, second son of Mr William Nelson, of Waikoko, who passed away very quietly and peacefully at his residence, Whakamarumaru, early in the morning of October 29th. 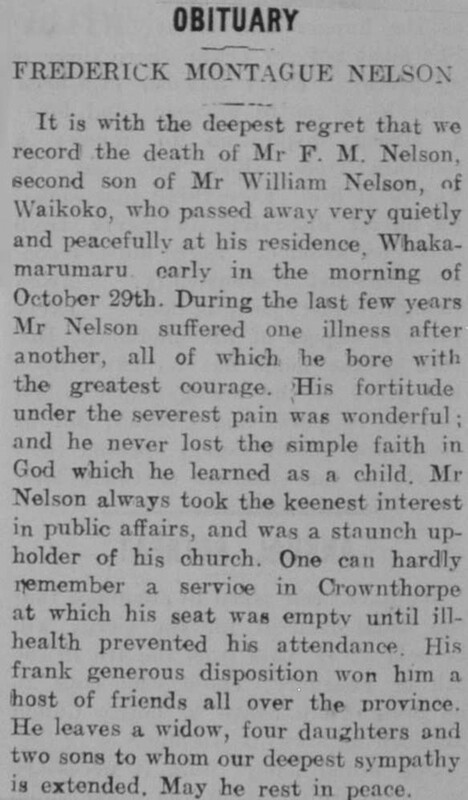 During the last few years Mr Nelson suffered one illness after another, all of which he bore with the greatest courage. His fortitude under the severest pain was wonderful; and he never lost the simple faith in God which he learned as a child. Mr Nelson always took the keenest interest in public affairs, and was a staunch upholder of his church. One can hardly remember a service in Crownthorpe at which his seat was empty until ill-health prevented his attendance. His frank generous disposition won him a host of friends all over the province. He leaves a widow, four daughters and two sons to whom our deepest sympathy is extended. May he rest in peace.